Hypericum (Hypericum androsaemum), or Tutsan, is a variety of the St. John's Wort herb that is grown for its colorful berries. Depending on the variety of Hypericum, the berries may be peach-colored, red, brown or green. The berries are born at the end of long stems in mid-summer after the bloom period. Hypericum berries are popular in the florist trade, especially during the holiday and wedding seasons, because they hold on the stems and do not stain hands or fabrics. Hypericum is appropriate for growing in USDA Horticultural zones five through eight. Find an area in the garden that is exposed to at least six hours of sunlight each day. Hypericum survives in less sun, but the berry production will be less. Expect to plant multiple plants 36 inches apart to provide good air circulation around the plants, especially in warm and more humid climates. Hypericum is very susceptible to mildew if conditions are warm and damp. The area should be well-drained because Hypericum should not sit for any length of time in boggy or wet conditions. Clear the area of weeds and add a 1 inch layer of compost over the planting area. Gently work the compost into the planting area to a depth of 5 inches. Organic matter enriches the soil and helps the soil hold moisture. 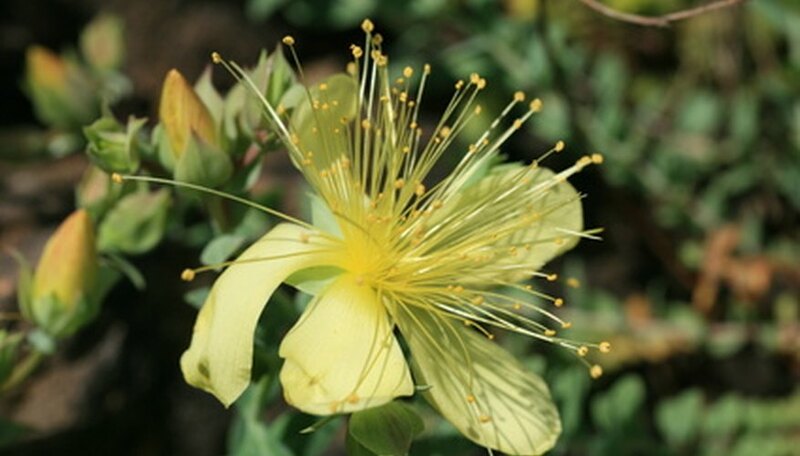 Plant the Hypericum plants at the same depth as they are planted in their existing container. Add water while adding the soil back into the planting hole. This is done to avoid leaving any air pockets around the roots. Add a one-inch layer of mulch around the base of the plants to conserve moisture and prevent weeds. Water the Hypericum deeply, if there is no rain, every seven days until established, which takes about three months. After that, water deeply if there is no appreciable rainfall for three weeks. Apply a standard garden fertilizer appropriate for shrubs in early spring when new growth appears. Be sure you are buying Hypericum androsaemum if you are raising the plants for berries suitable for flower arranging. There are hundreds of different varieties of St. John's Wort, and most are not suitable for cutting. Cut berries when the branch is full and most of the flowers have turned to berries. Leave the leaves intact on the stem. Place stem ends in a bucket of fresh water after cutting. Pull off any leaves below the water level so they cannot rot and contaminate the water.